For years sitting as an empty hole on the eastern shores of the harbour, an eyesore, a broken tooth, a derelict blot on the landscape left behind by the departing Defense department – we Wellingtonians had joy in our hearts and hope in our chests when, just over a year ago, the derelict blot of Shelly Bay was decreed to at last be on the move, to be transformed, with ownership finally settled and a large name tag: Sausalito of the South ! 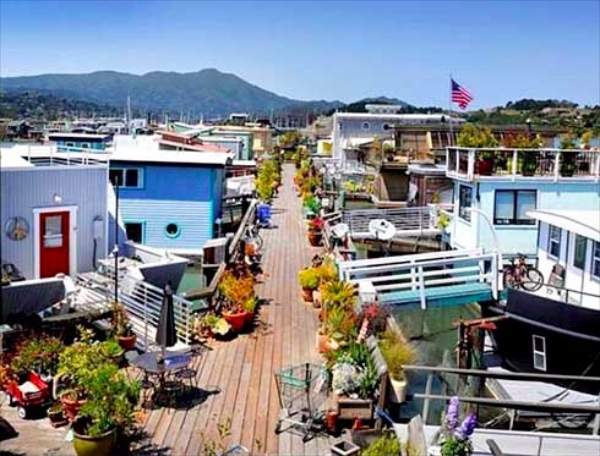 Visions of floating house-boats filled my mind – Sausalito is, to me, famous most of all for it’s floating city – and a rich diverse architecture of slightly hippyish people keen on forging new homes out of recycled materials. 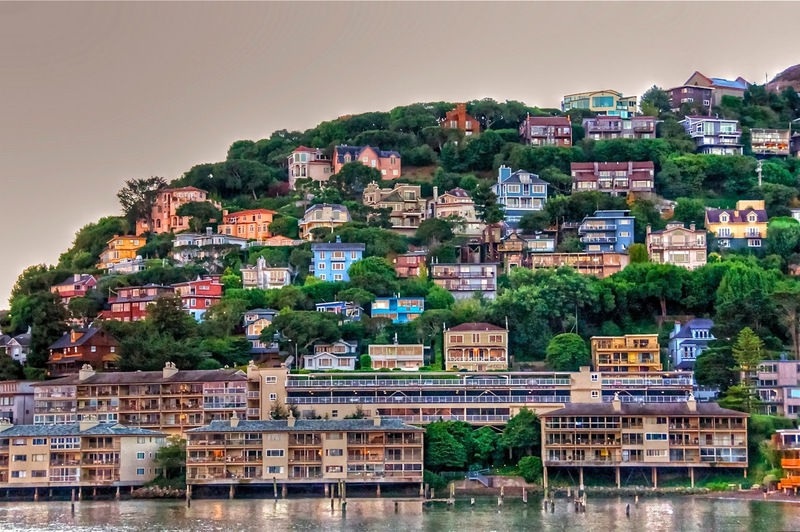 Just over the Golden Gate bridge from San Francisco proper, Sausalito is home to the counter-culture as well as a sometime home to academics at the nearby monstrous university at Berkeley. There are a huge amount of parallels with the community at Shelly Bay, which similarly exists not far from the city of Wellington, and exists on the side of the harbour not far from the monstrous world of Weta. There is similarly a semi-derelict world of architecture at Shelly Bay, not yet recycled and not yet floating – in fact, much of it is definitely sinking. The wharfs are steadily collapsing, something that no one seems particularly worried about, and there appears to be a nice art gallery, a man who makes screen print T-shirts, a cool shop with nautical whirlwind quirky knick-knacks, and of course the relocated world-famous Chocolate Fish Cafe. I was excited when Port Nic Settlement Block got the land back – well deserved and long overdue – but slightly disappointed when Ian Cassells became involved, although maybe that’s just me. He is a developer who likes the slightly tatty look, having perfected it in Cuba St where it fits into the Left Bank quite well. The tanalisation of Cuba Street, as Tommy Honey once tagged it – a phrase that has stuck with me ever since. I don’t mind the style – slightly silvering, steadily aging, pinus radiata everywhere, and a quirky aesthetic, but I do mind that he doesn’t seem to select very good designers. I’m not sure who designed Left Bank, but it is terrible design in so many ways – I can’t even call it architecture as it is just badly jumbled forms and semi-finished buildings that look like they were designed by a third-former with a stubby crayon. Not a good look. Yet somehow, here, it works. Bohemian sells. However, while the slightly down-at-heel ethos may work well with Cassells and his team, I’m not quite so sure what Port Nic gets out of it. Dave Armstrong at the DomPost puts it well here, worth reading, even if the metaphor goes on for too longalito. Wayne Mulligan puts forward a very different viewpoint here, on Waatea News. The development company is apparently a joint venture between Cassells and Port Nic, although I’m not sure whether it is a 50/50 split, and I have no particular opinion on whether or not the Council land should be sold at one price or another, unlike some over at Scoop. Frankly, I couldn’t care less. What I do care about however, is the quality of the architecture and the public spaces at the completed development. Let’s start at the beginning (a very good place to start). Transport first. The (current) road is winding, and the road is long. There are only two places to get off it – one on the east side over in Worser Bay, and the one on the south-west end at Miramar wharf. The thought of 500 cars driving from there to the CBD every morning is hideous – above all, the traffic needs to be sorted first. Of course, if there was a Light Rail solution to the airport, people at Sausalito South could easily walk or bike to the station and leave any cars at home. Perhaps that is one of the answers – plan for there to be absolutely no car-parking on site. Bicycle only. That might work. Are they rich folk or are they poor people? Fat fuckers or skinny lab rats? Real hard-arsed cyclists or just Mamils looking glossy and sweaty? Weekend warriors or everyday isabellas? That might also really piss off the wealthy toffs who might want to live there too – and for that, I say, tough cheese. If Port Nic is involved, this development shouldn’t be aimed at the upper echelon of Pakeha wealth bracket, but perhaps at the lower cost end of the market – poorer people, browner people, yes indeed, Maori people, the goblin folk working away at Weta perhaps, or the orcs working at the airport, or the hobbits in Rongotai and Kilbirnie retail. Not the Elvish overlords of the city in the CBD in their Porsches and Mercedes. Not them. Not this time. They spoil the party. Although, of course, they are the ones who can afford to pay for the party. But the architecture is, as always, for me the main thing. The renderings we have seen so far are neither here nor there, neither good nor bad, they’re just blurry and indistinct, gray wireframe outlines of nothing much. I can see that there is a few tall buildings on the hillward side of the road, and lower buildings on the seaward side, but we can see nothing of the architecture. Is there still a path for the public to walk around the edge, and is it generous or is it skinny and miserly? Every time there is a weekend cycle race, where do they go? Through the middle, round the edge, or out the back? At present, the pictures presented are deliberately undefined, and that’s not good enough for me (I am rather picky). There is so much more that we need to know before we can feed back to the Council. Who is the architect? Where are their plans? What about the urban designer? And the landscape architect? The engineer? I want to know the team involved, to get a feeling of what the project is going to be like. Is there a road between the two rows of housing, and what would it be like living in that back row on the ground floor? Would that work? Can it work? How would it work? 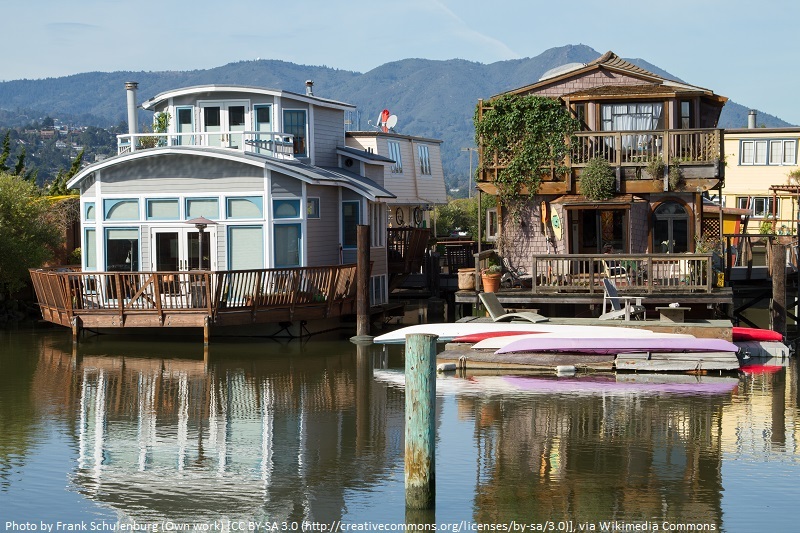 CC8YNN Floating Homes, Sausalito, Marin County, CA. Image shot 1987. Exact date unknown. Noooo ! Not all of it, surely? I think there were different architects on the left side from the right side, and the architects of the Black bit at the back were definitely different again? 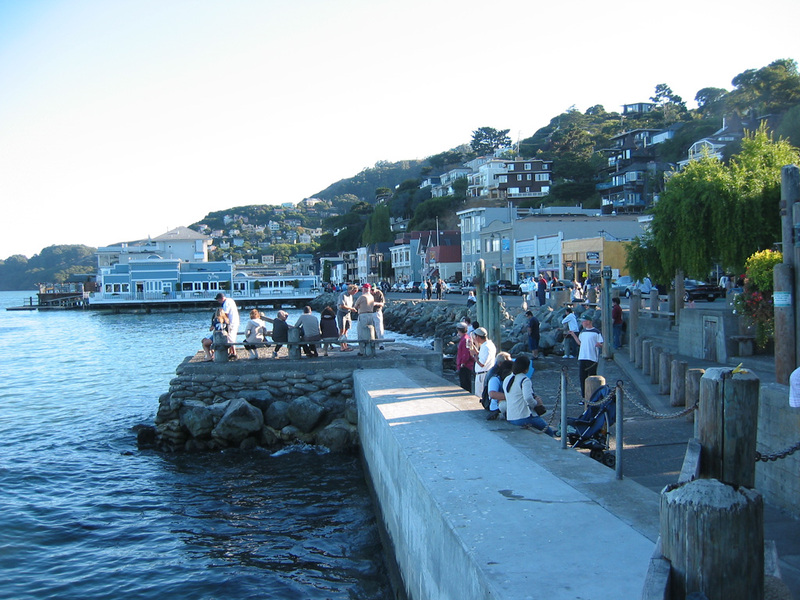 You may say there is a strong similarity between Shelley Bay and Sausalito, but to me they look very different. The pictures of the proposed Shelley Bay look very rectangular and corporate, very much like little stacked boxes on top of each other. The development plans appear to be recreating Oriental parade in Shelly Bay. Surely this is not the appropriate response? Shelly bay is currently the yin to Orientals yang and that’s why it works. Commercialising it with what appears to be high density development for the gain of a small few is not the right move and would be a lost opportunity for an area with potential to be a great public space. The council or some powers that be should step in here and ensure amenity for ALL its ratepayers. Cassells must have enough in his coffers now to be able to give something back for the public good. And isn’t that the whole purpose of the Port Nicholson Block? It’s the ol’ money-go-round isn’t it. I say break the development up into small lots and sell them cheaply to buyers who are willing to develop their lot and hold onto and occupy it (as a dwelling or workplace or both) for the next 50 or so years. Then do away with building regulations and see what happens. Thanks Andrew, Russell and m-d – yes, I think I tend to agree with all of you. There’s no doubt in my mind that this could be a fantastic place to live (facing north-west or just west), it’s going to be a wonderful place to come home to in the evening, have a drink on the pier or on the balcony overlooking the city. All highly desirable and enjoyable. But if you look at all the recent waterfront developments, the Clyde Quay, the Odlins, the Market Lane etc – they all have one thing in common. They’re sterile. Its partly a problem of the architecture, partly a problem with the tenants. Rich people who can afford to have an apartment in Clyde Quay are buying a top product at a top price – horrendously expensive. For a lot of them, it is just a second home, a pied-à-terre if you will, a city pad where you can go at a pinch. It’s not the main pad and as a result, the development is not that lively. For Sausalito South i.e. Shelly Bay, it needs a system of architecture and of ownership that can suit a more freeform architecture,a nd a more flexible, friendly, person. Not one that is indicated by the current drawings. “The Port Nicholson Block Settlement Trust is involved here. I gather it’s teamed up with Ian Cassels, and the council will sell most of its holding to him, keeping back some of it for public parks. They won’t be very big parks if a planned 150-bed rest home, a boutique hotel offering about 50 rooms, 280 apartments, 58 town houses and 14 stand-alone homes, also a ferry service, cafes, bars, shops, and possibly a village green and a brewery go ahead. “A village green, with all that evokes of ye olde Englishness and inherent colonialism, of plastic souvenir tack and lolly wrappers. I’m cringing already. Russell – what nonsense. Why does Shelly Bay have to be the yin to Oriental Bay’s yan? There are plenty of other bays in Welly similar to Shelly… think Scorching, Breaker, Princess etc. What Welly NEEDS is QUALITY space for housing. Oriental is the only north-facing bay in Wellington, which is why it’s so popular. Shelly is almost north-facing so will also be popular for housing – no where else in Welly can provide that space for growth (where people actually want to live). There’s an abundance of green space on Welly’s fringes and hills, so it’s not as though using Shelly for housing is going to materially harm Welly’s charm from that respect. Without developments like this Welly won’t be able to attract people to the region going forward. It’ll all be locked up with no room for new entrants. Not everyone wants to live in Churton Park surrounded by hills! JC – good comment, thanks. What do you think about the transport to and from there? A ferry seems like a great idea, but I know lots of people would want to drive as well – how can that be managed without chaos? Great post Levi and very good questions. I would strongly encourage anyone who cares about this issue – whatever their view – to make a submission. There are quite a few different views and quite a few different issues in play. 1 – Transport. I have read the resource consent decision which is pretty thin on transport – and will check out the TDG and Council officers’ reports which it behind this. The idea is to include a ferry service and I agree with all your points about that. That will help but the road will remain important. Yes there is a harbour side promenade. However from Shelly Bay to the Miramar Cutting the plan is for a 6 metre road width and a 1.5m I think lime chip ‘shared pathway’ for walking and cycling. I am sure you can see plain as day that this is a safety problem in the making. With a large scale development at Shelly Bay there will obviously be more traffic, cars, service vehicles (bus ? ), walking, cycling – and a 1.5 m lime chip path will not suffice – for one way travel let alone two way. IMO that is a direct consequence of the development and a wider shared pathway is for now, not an add on for later. That of course would have resource consent implications. I shall be very interested in the depth of transport analysis that sits behind this not being included. 2 – Design. 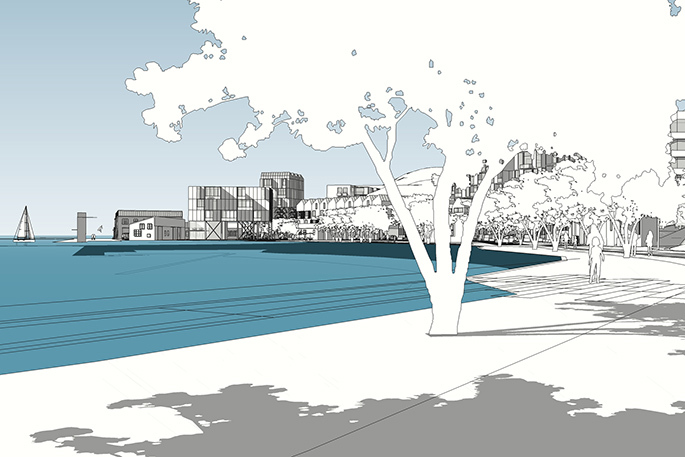 IMO the large scale context of the proposal – parks on the water’s edge, promenade, active edges, higher buildings at the rear tucked into the hills, lane ways between those buildings, retention of 4 older buildings, all looks good. It fits well with the Shelly Bay Design Guide in the District Plan except for the height of the bigger buildings. You may well have a point about individuality of design vs coherence of design and quality of delivery is a very important issue. On the other hand people have said to me ‘oh it will get dilapidated over time’ but that is a function of quality at the outset and maintenance thereafter – something shared by all buildings, not just at Shelly Bay. 3 – Financial arrangements. Levi, you say they don’t matter to you. I think they do matter and we need to be consistent with our relationship with any other developer who would normally pay for all on site infrastructure and the growth related share of infrastructure (eg shared path) off site. 4 – Finally Resource Consent. This has been granted on a non notified basis because the site is a Special Housing Area (SHA). I was one of 5 or 6 councillors in the previous term who did not agree with Shelly Bay having SHA status. Of course it makes development easier and quicker, but it means that the kind of design issues you raise will quite probably not get raised. Sometimes that is more important, sometimes less. There is a clear drive nationally to make the ‘red tape’ process quicker and easier – what that also means is the level of scrutiny is less that it should be at times, and developments which will be around for probably 100 years don’t enjoy the benefit of being scrutinised. That would have allowed questions of design and of transport to be better and more transparently considered. Thank you as always Levi for raising these intelligent questions – and everyone else for participating in discussion. I am always happy to meet and talk on any of these matters too. Thanks Andy – good reply – but asking the public to make a submission? Haven’t we only got the opportunity to comment on the sale of the thin strip of land currently in Council ownership? We can’t actually make any meaningful comment about the proposal for the development itself though, can we? 1. Transport is a massive issue, or rather, certainly will be. Not just in terms of people wanting to drive to work in the morning (although that will be the largest issue) but also people, cars, bikes, and most importantly: the Peloton of riders that like to sweep run the Miramar peninsula most weekends (and, who knows, maybe the weekends too). Seriously: the issue of a Sausalito bus needs to be made mandatory, rather than providing hundreds of car parks. And that 1.5m wide lime chip shared path just isn’t going to cut it either. What figure did the Basin Bridge enquiry come up with in the end for the width of a cycle path? Wasn’t it that 3m is too narrow and 4.5m was the width to aim for? 2. Design – One route may be to make sure that it is not all designed by one architect, but instead ensure a variety of designers to get a variety of forms. 3. Finance – yes, they do matter, but unlike some people over on Scoop and Stuff, I don’t really have a strong opinion on this. We need development – our city needs developers – but we do need to make sure that the WCC doesn’t just lie back and let the developers walk all over you. Some people pay for that service, but the ratepayers shouldn’t have to. We rely on the Council making a firm but fair bargain. 4. RC – my thoughts exactly. SHA = no RC = no scrutiny = crap output. So – are we (the public) allowed to mention any of that in a submission, or is the land swap deal the only permitted subject? In later years Shelly Bay was only used as accomodation for airforce personnel and they ran their own shuttle buses into town. Maybe as part of their sale package the developers could run a regular shuttle to the ordinary PT hub in Kilbirnie. The 1.5m shared path is insane. An alternative would be to do as many dutch towns do. Walking, cycling, emergency vehicles and PT uses the direct route i.e. the Cutting to Shelly Bay, enforced by retractable bollards. Other motorised traffic must go around a longer less convenient route i.e. the Peninsula. Before the residents of Karaka Bay Rd get upset, the effect is that the motorised traffic is reduced, so their worst fears would not occur. A more realistic option at this stage would be a very low speed restriction, say 20kmh. As other comments above, given the SHA status unfortunately I think the horse has bolted on Shelly Bay! William, thanks – and yes, you are probably right about the wave profile, but then again: anything is possible if you put your mind to it. My defence is: they started it! 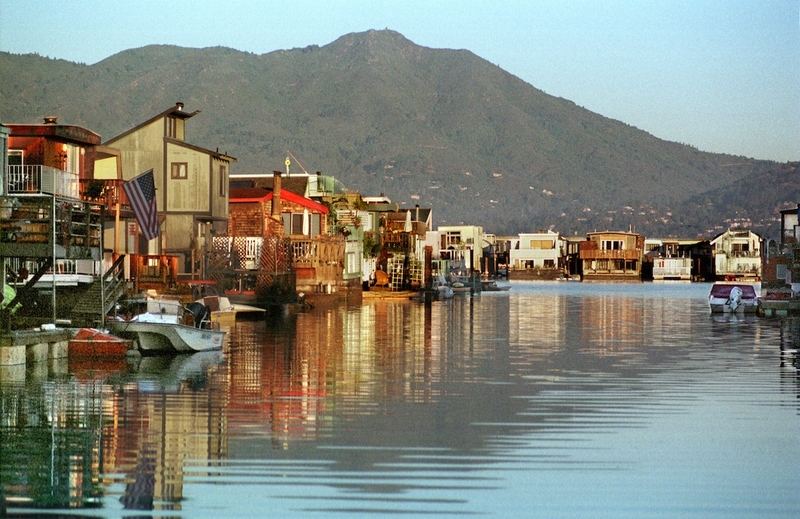 Yep – the developers put out the line about the Sausalito of the South, but forgot to say anything about the house boats. I think they were just concentrating on the similarities of the curve of a bay angled towards the setting western sun. 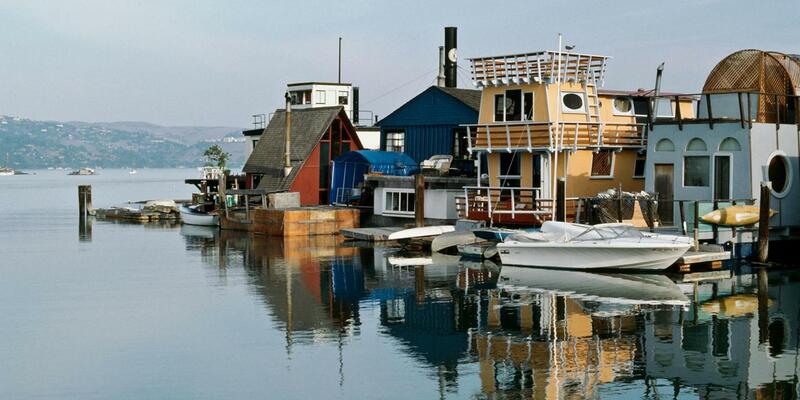 Myself, the whole spirit of the San Francisco hippy movement and the floating houseboats are all part of the same thing. It’s like the whole of the Aro Valley set off out to sea. 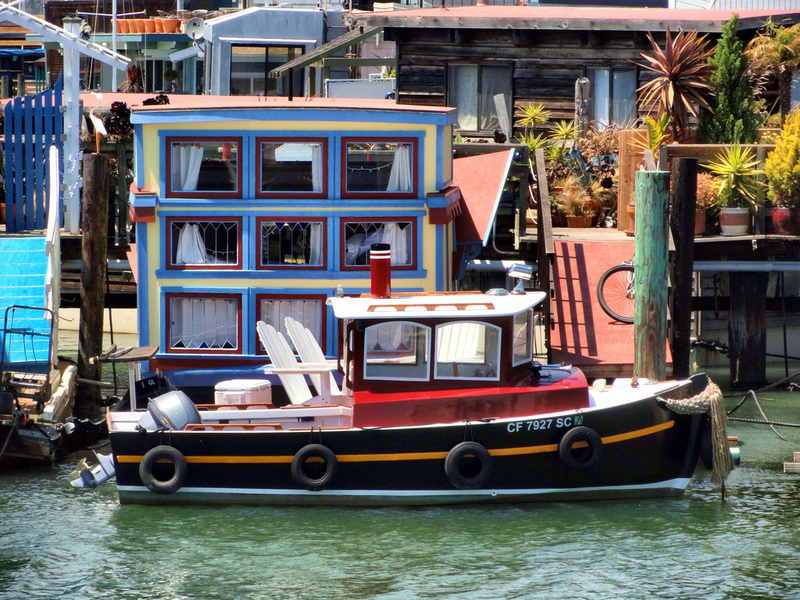 You simply can’t mention Sausalito without mentioning houseboats. It’d be like mentioning the Vatican without the Pope. Or going to the Zoo and not seeing the Lions and Tigers. Please find below a response that I have written to the DomPost regarding Rosemary McLeods Opinion piece. It is hoped that the DomPost will publish it to go someway in clearing up inaccuracies and misunderstandings. It also answers some questions raised in the comments above. For architect’s like me it is usually wise to roll with the punches of public opinion and let what is said wash over, or under. However I cannot let your columnist Rosemary McLeod get away with her column (‘We’re funding Shelly Bay but there’s no transparency’ May 4). Her opinion piece about Shelly Bay and other random issues (Te Wharewaka, Te Papa, immigration…) indicates that she is poorly-informed. I have chosen to respond. She intimated that it ‘could be another cheap and ugly development …because in this city…nothing has to meet any aesthetic standard.’ She also suggested that architects and landscapers have not been given the opportunity ‘…to dream up creative ideas…’. I have always been a person who has attempted to make the urban environment a better place. Sometimes this seems to be cleaning up the mess others have previously created. 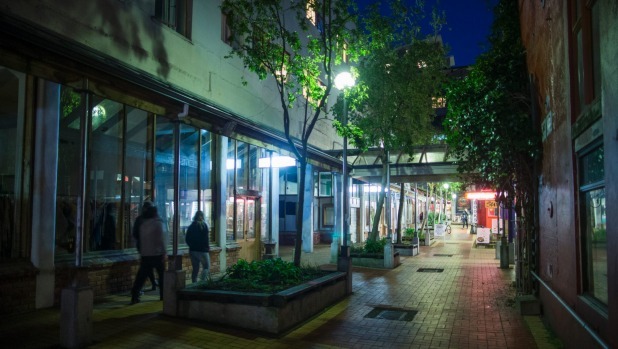 This objective and desire to create a better place is also shared by The Port Nicholson Block Settlement Trust, The Wellington Company and Wellington City Council. I lead the design team that established the Shelly Bay Masterplan and Design Guide. I believe that our credentials make us worthy to have undertaken this task. Michael Bennett (architecture+) is one of NZ’s best designers, landscape architect Meagan Wraight (Wraight and Associates) is at the top of her profession and received an Arts Foundation Laureate Award, Graeme McIndoe and Andrew Burns (McIndoe Urban) are without peer as urban designers. I wish to defend their reputations, as well as my own. The Masterplan and Design Guide that we developed establishes a framework that sets standards that will be monitored and assessed by a Design Review Panel for the design of each new building, house, renovated structure, and open space project. By these documents and this process the design quality will be ensured. So for McLeod to suggest that Shelly Bay will be an eyesore is both wide of the mark and insulting. For reassurance she should take the time to study the documents. I agree with her about the term ‘village green’ evoking ye olde Englishness. That was a debate I lost. I advocated calling it Shelly Bay lawn or some other name. However ‘village green’ is just a place holder, and a descriptive name. The space itself will be worthy of its desirable position beside the harbour and a welcome green public space for all to enjoy. 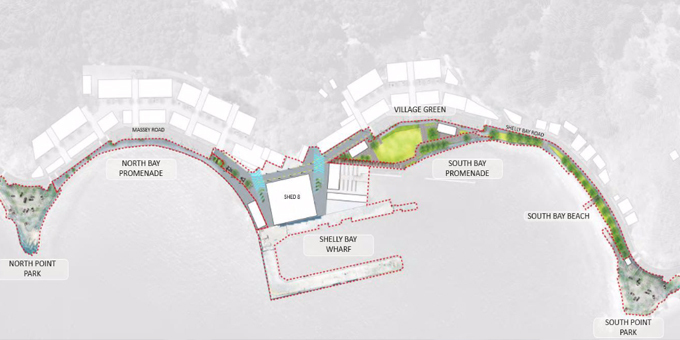 As an aside, Shelly Bay has mostly been out of bounds and locked away from the residents of Wellington up until now, and its redevelopment will open it up and make it accessible. McLeod said she ‘rather likes’ Shelly Bay in its existing run-down state. She omits to mention it is largely privately-owned – by PNBST – who are entitled to maintain and upgrade their property. It is an opportunity to provide places to live, to work and to play for the enjoyment of both locals and visitors. For it to sit derelict is a luxury only the affluent could afford. The PNBST is not affluent. At the end of her piece she states: ‘Why don’t we work actively on solving those problems..’ referring to Maori educational, incarceration, addiction, homelessness and suicide issues. Ironically her comments about Shelly Bay only undermine PNBST’s desire and ability to improve their situation. Commonly referred to now as Te Wharewaka, this building was given the offical name of ‘Te Raukura’ at an opening dawn Ceremony on Waitangi Day, Sunday 6 February 2011. ‘Te Raukura’ is of special significance to descendants from Taranaki iwi of Te Atiawa, Taranaki, Ngati Ruanui, Ngati Tama and Ngati Mutunga. Previously the area where the building is located was harbour frontage to Te Aro Pā, one of the largest Māori communities in Wellington up until the 1880s. The building sees the re-establishment of a Māori presence on Taranaki Wharf, notably absent on the waterfront since that time. I was, with my colleagues at architecture+, the architect of Te Raukura and can confirm that apart from its cultural significance, it performs an important urban function of defining public realm space on four sides including Odlin Plaza to the east, and the Whairepo lagoon to the west. Also it functions as a wharewaka, a wharekai and a wharehui. I am sure Morrie Love would be happy to show McLeod through the building and tell her about it and remove the mystery. Last, and incredibly, McLeod implied a ‘covert’ deal has been done between the City Council and the developer – this was after the Dominion Post outlined that no deal has been done and that Wellingtonians would be asked for their opinions in the next few weeks on the proposed sale or lease of the Council’s bits of land on the site. Rosemary, it would be nice if you made the effort to inform yourself. Nobody is hiding anything from you or the public. If you can’t find it, ask and someone will help you. Fantastic – thank you Stuart for replying, both to the Dom Post and also here. We really appreciate it. And your reply answers a few questions we have had – i.e. who the team is (all round good responsible designers, no doubt!). That actually makes me a lot more comfortable, knowing that there is a good team, in the likelihood of getting a good quality outcome from the Shelly Bay redevelopment. I know that when Arch + were working on the WhareWaka in town, there was an extremely robust process in place, with the TAG looking at your work every step of the way, and that is the key thing that I think is missing here. Obviously, the situation is different at Shelly Bay, form the central Wellington Waterfront. For a start, Shelly Bay is not quite as public a location, and is also on what is now private land (was the Wharewaka on Tenths Trust land, or WCC? I’m not sure). Shelly Bay is part of a SHA, by the sounds of it, and as you know, that means that developments can go ahead with almost zero public input. As you may have gathered by now, that’s where I think the process falls down – I don’t think there is anything wrong with public input – although of course, some members of the public are reasonable and others are not. I’d be worried that without public input, or without a facility like the TAG process used on the Waterfront, that standards of quality might drop. For instance – Left Bank. Not quite up to my standards, but I guess it is appropriate for its market. Would you be able to say anything about the issue that really vexes me – and perhaps I am wrong and you can lay my concerns to rest – but: what to do about traffic. No doubt you’ve been working with a traffic engineer as well, and perhaps they could even leap in here with a comment or two, but my main concern is: how does it link in with the existing roading network at eh junction near Miramar Wharf? Is it going to be noticeably worse? If so, how much? What to do about it? If McLeod is right about the numbers i.e. “planned 150-bed rest home, a boutique hotel offering about 50 rooms, 280 apartments, 58 town houses and 14 stand-alone homes,” then that could be almost 500 cars before you even take into account the many visitors that are presumably hoped will flock there. A ferry stop HAS to be a method of transport, I hope you would agree. But also – what about the cycle track around the peninsula? At present, cyclists can go barrelling around there, really only encountering cars during the weekend. But building a reasonably intense urban village on either side of the track is going to have a big effect, certainly one that a 1.5m track won’t resolve. Any advice on that? Levi, to answer the question about quality standards. 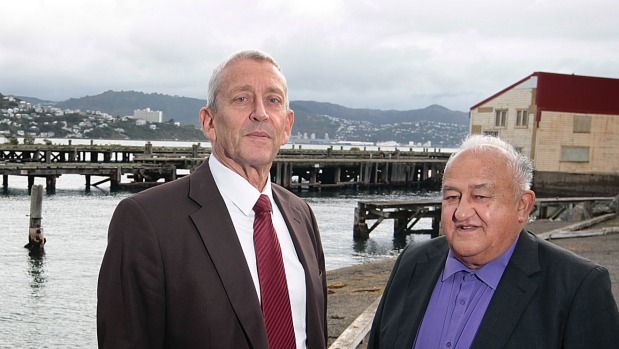 The agreed process is that a TAG process will be adopted at Shelly Bay. A Design Review Panel will assess every project – new buildings, renovated buildings, open spaces, public realm etc. Our Design Team has established a Master Plan and Design Guide. No individual project has been designed yet. The MP establishes the parameters which projects need to comply with and the DG establishes standards by which they will be assessed by the Design Review Panel. I’m less able to answer the question about transportation, as that is not our area of expertise or part of our commission. What I can say is that there will be up to 300-350 dwellings plus commercial activities (cafes like Chocolate Fish, a boutique hotel, maybe a micro brewery, small offices, retail etc.) and each dwelling will have a single carpark. There was much debate about this and whether that was too much or too little. There will also be about 120 kerbside carparks for visitors etc. and carparks for staff of the commercial activities. TWC has also had discussions with East by West ferries who, I understand, would add Shelly Bay to their route. Traffic Design Group has been part of the Resource Consent application and would be better placed to speak about the roading capacity. However, given radical and substantial changes in the last few years regarding personal transportation it is problematic predicting this issue. The growth of car clubs / sharing (Mevo etc.) adoption of electric and traditional cycling, and the reduction in car ownership by younger generations all suggest, to me, that it would be premature to be concerned about the capacity of the existing roading infrastructure. I think the design is a very good response to the Design Guide – and the over DG heights of buildings at the back of the site are absolutely fine because they sit against the much larger background of the hillside. Levi – good questions again thank you. I think you should feel free to comment on any relevant issue including the development itself, infrastructure and finance. Yes only about 1 hectare of Council land is proposed to be sold/leased. However the development itself could not happen in the way proposed without Council land. All these issues are linked together. I agree completely that transport is a big big issue here, and IMO it has not been addressed. I have now received and read the Traffic Design Group report and officer response and TDG follow up which was part of the resource consent process. It seems to me that the consideration of the roading environment in Shelly Bay was fine, and there was some detailed consideration of the intersection at Miramar Ave, but Shelly Bay Road between them is considered only in a most cursory way. It is pretty plain that there are concerns about this in those papers too. TDG forecasts that the current traffic level of 1000 vehicles per day will increase to around 4500. (ie significantly). They don’t see an issue for pedestrian and cyclist safety on the basis in large part of an assessment of walking / cycling numbers done in one August week last year. You might well think that August might be a low point for walking and cycling round the bays ! The problem as I see it is that the road will almost certainly need to be widened – and then you get into either major works on the hill side of the road, or building seawalls. Of course that is expensive, and consent and community support may well not be forthcoming. The need for such widening comes directly from the development of Shelly Bay – and yet the proposal as it stands is that the development goes ahead and then when a problem becomes evident the Council/ratepayer has to fix it. You said that you don’t have a strong opinion on this but we need to make sure there is a fair / firm bargain. Currently IMO there is not. Personally I would like to see the development go ahead, but the deal being proposed is a very poor one, and the dollar cost to ratepayers is much higher then it should be. That has to be resolved satisfactorily. Thanks Again Andy and Stuart – really helpful replies. There is one possible answer to excess traffic – in terms of not having to widen the road and potentially not having enough / adequate space for cyclists and pedestrians… make the road for cars only one way. Around the entire peninsula. Make the other lane for cyclists only (in both directions), and then all that would be needed to be done is a decent footpath. Would it make people use bikes more often? You betcha! One way peninsula? That’s a very silly idea. It might make traffic flow smoother, but it would come at a huge price for the people in Karaka Bay etc. There’s nowhere to get off the beaten track except for the other side. But let’s have a look at what the figures say. If TDG figures are in any way correct (even taking into account Foster’s concerns about the count being done in August, the coldest and least cycle-friendly month of the year), then 4500 vehicles per day (assuming no one drives there at night), is 4500 over about 15 hours. That’s notionally 300 per hour – which is 5 every minute, or one every 12 seconds (if spread evenly). It’s pretty obvious that there won’t be an even spread, but instead there will be a couple of bunched times – i.e. morning peak heading into town and evening peak heading into Shelly Bay. Even if we conservatively say that peak hours are doubled (but it is likely to be way more than that), then that implies that at the Miramar intersection, there will need to be a car through every 6 seconds. That sounds… unlikely. Alan – well, that may be silly to some, but the scenario you describe would be very silly indeed to existing residents of Miramar. Thanks for doing the numbers – I’m imagining the situation you describe wouldn’t be a very welcome addition to residents from Miramar? Not necessarily that big a deal. Cars could sit at the south end of Shelly Beach Road at a giveaway sign as they do now and periodically pull into the central median, and drive along Cobham Drive etc with others, when they get a chance. It’ll just be a question of finding a space in the traffic coming from further East. But still, if the problem persists, then Council will want to stick in traffic lights there (which would be a disaster further back at the main Cobham Drive roundabout to the airport) or, possibly more likely, another mini roundabout (there’s one at the bottom of Mapuia Road which seems to mostly work ok, although I haven’t been through at peak time). In a way, traffic flow might not be a big issue at all. In the morning, the amount of traffic going east at that time in the morning is presumably low. So, there shouldn’t be too many obstructions (i.e. cars driving east) and it should be relatively easy to get out into the central median. In the evening, the extra flow from people coming home from the city should be able to easily peel off from Cobham and go left down Shelly Bay Rd. 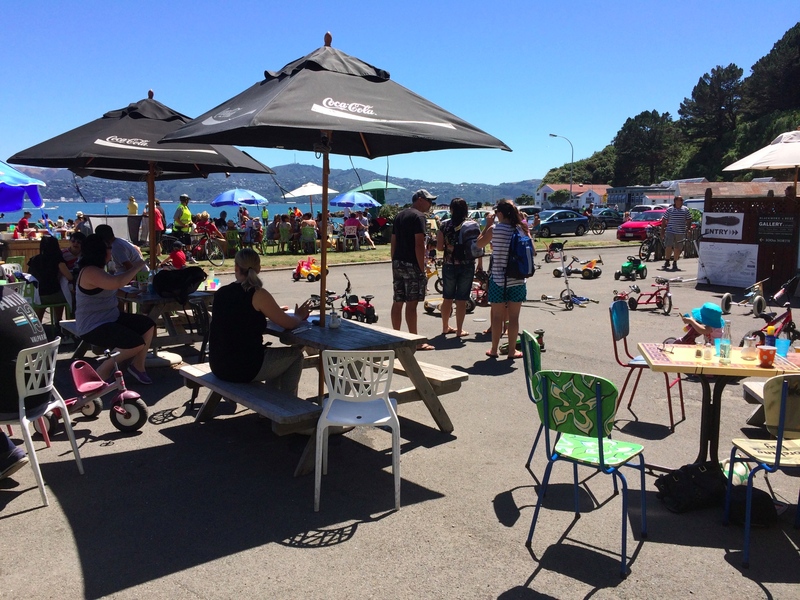 But I’m guessing that for anyone wanting to leave Shelly Bay at peak eying time, they will have a heck of a time. The easy answer to that is to ban cars and just make the choice more obvious: walk, cycle, ferry, or take a bus. Alan – i don’t think there is a roundabout at the bottom of Mapuia Road, but there is one at the junction with Tauhinu Road, and another one at the junction with Park Road. Maputo and Shelly are both, at present, simple T intersections. JDS – absolutely! But how popular would that be, with wealthy buyers of apartments at Shelly Bay, who are then not allowed to have a car? I’ve just found the documents, online, probably where I should have looked in the first place. There’s no sign of any public consultation on the WCC website about the sale of the WCC land – neither recently closed nor currently open. That’s a little confusing – I got the impression that Andy Foster was encouraging people to put in submissions over the land sale – if you can find a link for this (or advise of a timeline) then I’d be most interested. I think that we can probably all agree that a 22m wide road strip should NEVER happen here, and even that a 14m wide roadway is NOT the answer. That would make it a racetrack. The current 3m wide lanes are small, but adequate, just. The road is long and winding. The big inadequacy at present is the footpath, which is inadequate and largely non-existent in many places. The charm is that because of this, we have a rocky foreshore, where animals come and visit and sun themselves. Birds. Occasional seals and penguins. We don’t want to kill them, or kill that vibe. Whatever happens with Shelly, the car must not be the thing that kills off the special character. WCC has looked at making the road round the peninsula one way for cars eastbound on the inside lane from Shelly Bay to Scorching Bay, with the other lane two way for pedestrians and cyclists. Bring it on, I say – not silly at all. The growth of the employment within Miramar means that there’s now a lot of traffic going the opposite way from the traditional CBD peak, so the Shelly Bay/Miramar Ave/Cobham Drive intersection is going to be problematic. It’s being looked at by the Miramar BID in connection with the WCC cycleways etc project, and many of us await their proposals with interest. And absolutely agreed that the big current problem is the absence of a footpath, which a pathetically narrow 1.5m-wide shared path would do nothing to improve. But a big future problem will be trucks etc during construction, and buses and trucks thereafter. Don’t think the current road would cope in either case, but a 14m-wide road? Nooo! Good discussion. Four more quick points. 1. Alan – the 4500 is TDG’s number of vehicles per day – on behalf of Shelly Bay Ltd, the developer. The issue as Levi and Mike noted is that a 1.5m wide footpath simply is not going to be adequate for cyclists and pedestrians. Of course there would be expected to be more cyclists and pedestrians, and sharing the road with 4 1/2 times the current traffic volume doesn’t seem like a recipe for safety from my perspective. 2. Mike and Levi – I couldn’t agree more with you. 22 metres width is unnecessary, so is 14. In reality we realistically need 9 or better 10 (3-4 metre shared path). Can that fit and what impact will it have ? That is the key question. I think there would be widespread opposition to anything that damaged the coastal character and beaches – and rightly so. 3. One way traffic ? Aside of the inconvenience issue the other issue is that it would likely increase speeds. 4. Consultation – what I was trying to encourage is that people get involved when the consultation starts. We are working to put together the consultation material. Councillors are taking a particular interest in it as we want to make sure you get all the information we can possibly supply – to help provide informed response. So I am not sure when all of that will be ready – I would expect a few weeks. 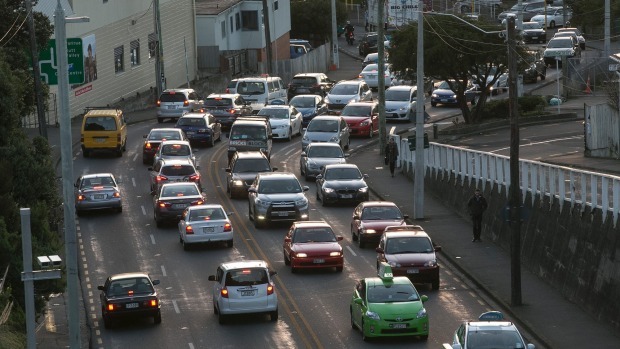 The additional traffic forecast from a developed Shelley Bay is not going to make for a safe cycling commute from Miramar to the CBD via Oriental Bay. Private vehicle use originating from a Shelley Bay development needs to be held at the current level. Imagine traffic lights at the Cutting intersection and the impact upon cyclists waiting for signal changes through the often windy and rain swept conditions. I’m not anti development for Shelley Bay but the full externalities need to be laid plainly on the table. If our country and our capital city are pushing for meeting our carbon reduction obligations and providing a liveable social democracy for all citizens we don’t want more private vehicles reducing our community health and well being. Don’t forget about the pollution impact from the vehicle emissions and road contaminants passing from the road surface through the storm water network and out into the harbour. State of Environment monitoring of SB by Greater Wellington already identifies a high load of metal contaminants in the harbour sediment as a result of former industry practices (Gasworks/Brickworks). Can we not have a redeveloped Shelley Bay without disadvantaging our current environmental and social equity? An offer by Building Solutions boss Richard Burrell seems to be aimed directly at the proposal currently being assessed by the Council. Didn’t Burrell used to be friends with Cassell? Or did they own a company together? “Council community planning and engagement portfolio leader Diane Calvert said the SBL development was for mixed use that included housing, tourism and hospitality, which was at odds with what Burrell had proposed.